This site is currently under construction, please be aware that information is still be collected. Access to SGaay Taw Siiwaay K’adjuu Heritage Site/Conservancy is primarily by floatplane, or helicopter, although Forest Service roads on Moresby Island are in the vicinity of the heritage site/conservancy, and overland hiking access is possible for those experienced in route finding. Takakia Lake is relatively small and floatplane access can be difficult for some aircraft under certain loads, but it is the only alpine lake accessible by floatplane outside of Gwaii Haanas National Park Reserve and Haida Heritage Site (where landing floatplanes on lakes is prohibited). 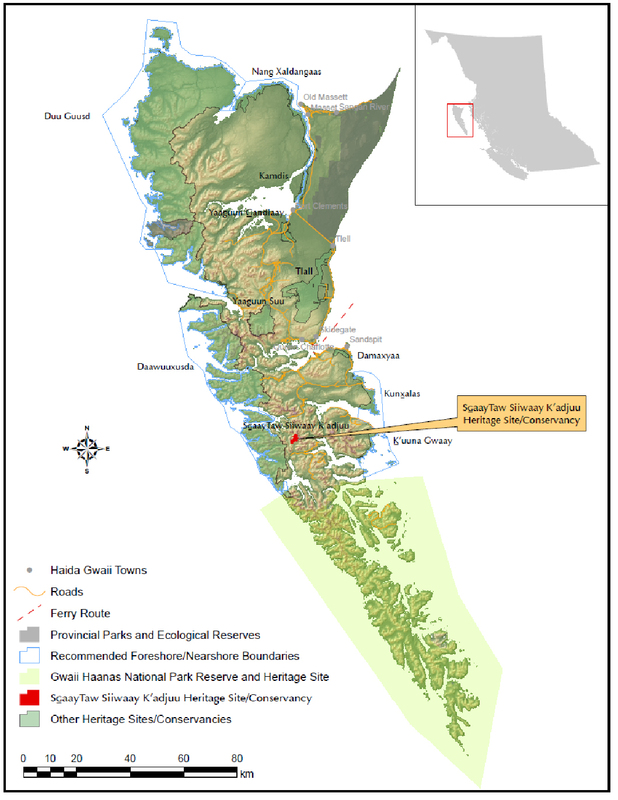 SGaay Taw Siiwaay K’adjuu Heritage Site/Conservancy is located on Moresby Island approximately 5 kilometres from Mitchell Inlet on the western coast of Haida Gwaii and 35 kilometres southwest of the community of Sandspit. It is part of an archipelago-wide system of protected areas that includes Gwaii Haanas National Park Reserve and Haida Heritage Site, several provincial parks and ecological reserves, and ten other heritage site/conservancies. In total, half of the land base of Haida Gwaii is now in protected status. The heritage site/conservancy includes all of Takakia Lake, and three other smaller unnamed lakes and their tributaries. The heritage site/conservancy covers 597 hectares from an elevation of about 500 metres up to 1,000 metres above sea level. The SGaay Taw Siiwaay K’adjuu Heritage Site/Conservancy area has been used since time immemorial by the people of the Haida Nation for cultural, social and spiritual purposes. The freshwater lakes and the surrounding limestone outcrops are one of the most important locations on Haida Gwaii for rare and endemic plants. The people of the Haida Nation have occupied and collected materials from SGaay Taw Siiwaay K’adjuu since time immemorial. Takakia Lake has longstanding cultural and spiritual importance to the Haida Nation as a sacred area and a location for the collection of medicinal plants. The area has not been inventoried thoroughly which indicates that the heritage site/conservancy may contain many other unrecorded cultural heritage or archaeological sites. 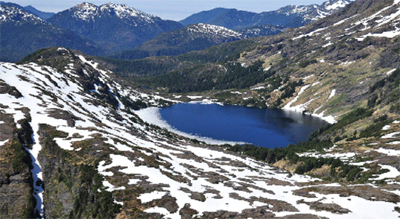 Many of the endemic plants found on Haida Gwaii occur at Takakia Lake. These include the Lance-fruited draba (blue listed), Enemion savilei (blue listed), Queen Charlotte aven (red listed), Calder’s lovage (blue listed), Alp lily (blue listed), Whorled lousewort (blue listed), Net-veined willow (red listed), Cordate-leaved saxifrage (red listed), Queen Charlotte butterweed (blue listed), Newcombe’s butterweed (blue listed), and Queen Charlotte twinflower (blue listed). The remote location of SGaay Taw Siiwaay K’adjuu Heritage Site/Conservancy provides an excellent opportunity to maintain biological diversity and natural values. Of concern, though, is the potential introduction of non-native species which pose a threat to local ecosystems. The management plan for SGaay Taw Siiwaay K’adjuu Heritage Site/Conservancy was approved in 2011 by both BC Parks and the Haida Nation.